On the face of it October couldn't have started with a harder fixture. Dingwall is a long trip at the best of times let alone when you sit bottom of the table with two points and two goals from seven games. That Ross County were top of the division and playing well just made it all the harder. Typically of course Queens chose this day to improve their lot a little and grabbed a point from a fiery encounter. John O'Neill scored with a brave early header and the Queens defence, and Colin Scott in particular, withstood a barrage of attack from the home side before eventually Martin Canning scrambled home an equaliser from a corner six minutes from time. Before then Gary Wood had seen red for the second time in the season and, in the aftermath of the equaliser, a stramash involving McColligan and County's John Rankin saw Steve Bowey also sent off for kicking the County man. The nine men though managed to hold on for the draw. The match was also notable for the appearance of a then unnamed "Nigerian" Trialist (later revealed to be Tope Arojogun) as a substitute striker who lasted five minutes before having to be replaced himself due to a pulled hamstring! A week later another Scotland international meant a blank league Saturday but a reasonably strong Queens side featuring three more Trialists won 4-0 at Annan Athletic. McNiven, Stuart Hill and the 16 year old Stuart McColm (2) were the goalscorers. As for the Trialists, the two Geordies were never named nor heard from again but Dimitri Pronovych, a Ukrainian u21 internationalist, would stay a few weeks and feature again. The pressure on manager Iain Scott was growing and it was widely believed in some quarters that if we could not beat Airdrie United at Palmerston on 15th March he would be dispensed with. How much truth there was in that suggestion we will never know because in the end we did finally win our first league game of the season but my goodness how close did we get to not doing so! It was a poor game and in the desperation to change things about young Scott Robertson was handed his first start for the club whilst Pronovych was named on the bench as a Trialist again. 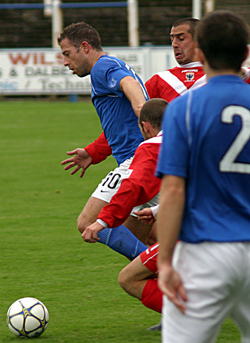 Airdrie's Allan McManus was sent off early in the second half for hauling back Brian McLaughlin as he tried to home in on goal. 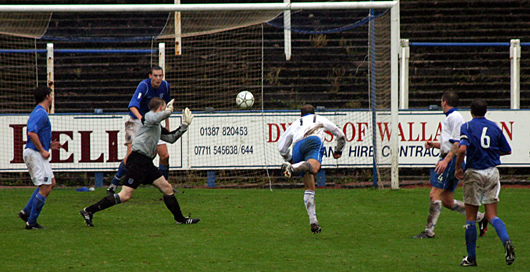 We couldn't capitalise until in the very last minute of injury time substitute Pronovych slipped a square ball to Paul Burns who wasn't closed down and had time to take a touch at the edge of the penalty area and place a shot just inside the bottom left post, deceiving Airdrie keeper Stephen Robertson for a dramatic winner. If the luck had finally changed though it wasn't long in changing back as St Johnstone arrived at Palmerston the following Saturday and dominated us at home in a way that no-one else did in the whole season. The match finished up a 3-1 win for the visitors but that doesn't do justice to their dominance. Steven Milne had them in front inside three minutes but Queens gradually worked their way back into the game and great work by McNiven and Burns presented Brian McLaughlin with an equaliser. The wee man turned quickly from hero to zero though as only a minute or so later he gave away a penalty by fouling Goran Stanic and Paul Sheerin duly scored it. In the second half the same player added a somewhat comical third goal as he first hit the bar and then scored with his own rebound as Stuart Hill "fresh aired" a chance to clear on the line! Again the pressure on Iain Scott had grown to high levels and victory at Brechin in midweek was surely needed to ease it at all. Although we did finally end a run of ten straight midweek defeats in all competitions, a 1-1 draw proved little use to either side. Despite Queens holding the upper hand early on Brechin dominated more and more as the first half wore on and could easily have had three or four goals rather than just the one Kevin Byers did grab before the interval. Early in the second half David McNiven pressured Steven Hamilton into heading Lyle's cross past his own keeper though and defeat was fortunately avoided. A visit to the league leaders St Mirren on a ground they'd gone a year unbeaten on wasn't really the best possible fixture to have next up in the circumstances and there were no surprises on the day as St Mirren comfortably and efficiently turned us over by 2-0. Yet again set pieces were our downfall with John Potter and Stewart Kean both knocking home Lappin corners in each half. That was the straw that broke the camel's back. On Monday 31st October Queens announced that they had "reached an amicable agreement between both parties" and Iain Scott was released from his contract as manager. Stuart Lovell agreed to take on the reins as caretaker until a new manager could be appointed but made it clear he did not want to be considered for the position permanently.